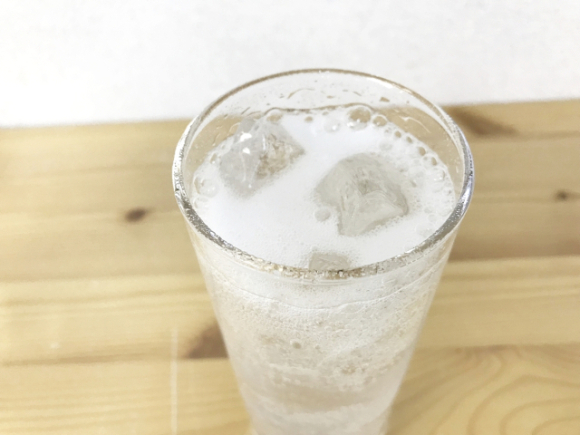 If you’ve been reading our site lately, you’ll know that Japan is currently gripped by a clear drink craze, with everything from milky teas to coffee appearing as clear-liquid products. Now Coca-Cola is joining the trend, bringing out a brand new clear coke that’s set to hit stores around Japan from Monday. We were lucky enough to get our hands on a couple of the new drinks before their official release date, so we decided to put them to the test to see if they tasted just like the regular dark-colored versions. The first thing that catches your eye, obviously, is just how clear these drinks are. Looking at it in the bottle, you really wouldn’t be able to make the distinction between this liquid and regular plain bottled water from the store. Adding the image of a more familiar Coca-Cola splashing itself around the label is a nice touch, and the only real color you’ll find, along with some tiny squares of yellow on the side, with a mention that the drink contains zero kilocalories and “one percent juice." We decided to pour the coke out into a glass of ice, and it was immediately clear that this was not plain water. It fizzed up around the ice cubes, giving off a delightful sound and a delicate, refreshing spray. There seemed to be a higher level of carbonation here than in a regular coke, fooling us into thinking it was a plain cider instead. That could’ve been a trick of the eyes, though, given that no matter how hard we tried, it just did not look like coke at all. We love the way these clear drinks mess with our visual expectations, so we were eager to see how the new Coca-Cola would confuse our taste buds as well. We took a good gulp, sat back to assess the flavor, and were surprised to find…it tasted just like Coca-Cola. There was a hint of lemon, which the company said it added as a refreshing accent, but the distinct coke taste was there, packing bagfuls of flavor just like the more common dark-colored variety. Tasting the familiar flavor of coke while drinking it as a clear liquid really messed with our minds in a way that we couldn’t help but love. We took another sip, and then another, trying to prepare ourselves for the big, bold flavor hit every time, but our eyes wouldn’t let us believe we were tasting anything but a clear, flavorless liquid. This surprising effect is one that we’re sure everyone will fall in love with, no matter how you feel about lemon-flavored coke. Developed over the course of a year, during which time dozens of different samples were tested, the new Coca-Cola Clear is more refreshing than sweet, due to the fact that the caramel ingredients have been left out to help give it its transparent appearance. According to Coca-Cola, it’s a very different formulation to the “Tab Clear” transparent cola produced by the company in the early ’90s. Coca-Cola is yet to reveal whether the new drink will be sold in other countries. Hooray! The 80s are back! "Sugar water" by any other name is still S U G A R W A T E R! Didn't we do this already in the 80's? Pepsi I think led the way with Crystal Pepsi, but I don't think it sold well? Still good luck to them, if it taps into that 80's nostalgia thing that's going around at the moment it may just work. Having worked for the Coca-Cola Company for a number of years, my question is, has Coca-Cola Japan gone insane? Will it still clean my 10 yen coins? I remember when I was very young, Coke tasted much better than today's. Probably higher carbonation due to its glass bottle. Also, a lot less sweet. Nowadays, it is just way too sweet. I do not even remember when was the last time I had Coke.